History and foreign affairs have always held me in thrall. So when I recently discovered a show on television, The Seventies, in which history and foreign affairs are married, I was in seventh heaven. As I was watching the show, they had an episode on America under President Nixon that looked at the end of the Vietnam War. Around the time I watched the show, the al Shabaab attack on dusitD2 in Nairobi had just happened. I got to thinking of Kenya’s involvement in the Somalia conflict since 2012, and what it has cost in lives and money. At the beginning when Kenya got involved in Somalia, there was a lot of jingoistic chest-thumping from many Kenyans, who firmly, if unrealistically and with not a little hubris, believed Kenya would go in, sort everything out in a very short time and get out with no comebacks. Clearly the jingoists were wrong. 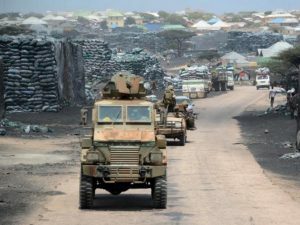 Seven years later, Somalia and al Shabaab are looking like a quagmire we should have avoided like the plague, or at least engaged very differently. I asked myself: How many Kenyan personnel have been killed in Somalia? How many Kenyans have been killed by al Shabaab? How many Somalis (including al Shabaab militants) have been killed by Kenyan forces in Somalia and in Kenya? Do we have numbers of the wounded or maimed on both sides of the conflict? If so, how many? I went online in search of answers and found a report on: www.counterextremism.com. From it, I calculated upwards of 382 Kenyan deaths, civilian and security personnel, since Westgate. Next I wanted to know how many Somali refugees are a direct result of Kenya’s interference or intervention (whichever you prefer) in Somalia? So far I haven’t found any reliable numbers. I would also love to know if there is a figure in Kenya shillings on exactly how much has been spent on the war in Somalia on al Shabaab? While searching for these figures, I began to think of Newton’s Third Law: For every action, there is an equal and opposite reaction. In the quick research I was able to do, I found that every time Kenya acted against al Shabaab, there was a terrible reaction from al Shabaab, who seem ironically to have adopted the old Israeli tactic of “if you hit us, we will hit back twice as hard”. It occurs to me that the best way to stop al Shabaab attacks would be to get out of Somalia right now. But because huge egos and assumed national pride are involved, there is no hope of that. Thus we are stuck in this hellish cycle of violence, until we have the guts to get out of the quagmire.